When Zhang Xiu has a weapon with greater reach than his current health, his attacks cannot be avoided. 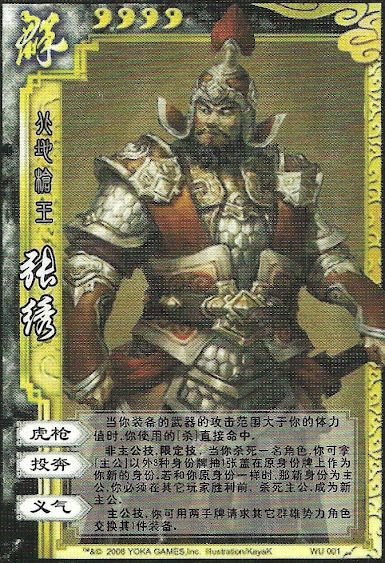 When Zhang Xiu is not the king and kills any player, he draws a role card. He chooses one from a rebel, loyalist, and spy. If the role he draws is the same as the role that he already has, his new identity is the king. To win, he must kill the other king before any other player wins. If the role he draws is different than his current one, the new role is ignored. King Ability: Zhang Xiu can ask any hero to exchange equipped weapons with him. If they consent, Zhang Xiu must then also discard two hand cards. "POWER ONE" works much like Huang Zhong's "Strong Bow". When Zhang Xiu draws a role card, he keeps it face down no matter what it is. He will set the new card down in a different spot than his old one. He does not reveal the outcome at this time. If the roles do not match, play continues on as it normally would. If Zhang Xiu kills another player, he draws another role from the allotment of three again, as if the first time never happened. Only if the newest role matches his original role, then he becomes king. It does not matter if both drawn roles are the same. If Zhang Xiu has matching role cards, he does not show it at that time. He must kill the king with his own hand to win. He may kill other people prior as well. If he does, he no longer draws a role card since he has a 'king' one now. This will be a big reveal to the rest of the table. When Zhang Xiu kills the king, he flips and shows his matching roles cards. He then becomes the new king. Any surviving loyalists are now loyal to him and rebels now target him. If Zhang Xiu has matching roles cards, he can still lose if the king dies. If the king if killed by other rebels, the game is over and the rebels win. If the king and loyalists kill every other player, they must also kill Zhang Xiu to win. This is even if he was a loyalist before. With matching role cards he is considered a king, and not allied with the current king. Even if he has matching role cards, Zhang Xiu cannot use "POWER THREE" until he reveals them by killing the previous king. He can also start out as king to use this power as well.